"I do." meowed Snowpaw quietly. "Then by StarClan, I give you all your warrior names." continued Bluestar. "Coalpaw, you will be known as Coalwater. Onionpaw, you will be known as Onionear. Smokepaw, you will be known as Smokeflower. Sandpaw, you will be known as Sandpelt. Snowpaw, you will be known as Snowminnow. 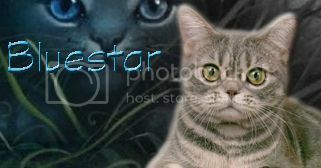 StarClan honors you all and we welcome you all as full warriors of FogClan." Coalwater blinked a few times, then sat there as the clan called out their new names. Onionear puffed out her chest in pride as the clan called out their new names. Smokeflower blinked, listening to the clan call out their new names. Sandpelt let out a snort to herself as the clan called out their new names. Snowminnow quietly sat there, listening to the clan call out their new names. "Coalwater, Onionear, Smokeflower, Sandpelt, Snowminnow!" cheered Deerkit from his seat outside the nursery. Froststep padded into the FogClan camp, carrying borage in her jaws. She made her way into the den she shared with Freezetail, placing the borage into the storage. "Let all cats old enough to catch their own prey gather for a clan meeting!" yowled Bluestar from the center of the clan camp. Froststep pricked up her ears and padded out of the medicine den to hear what Bluestar had to say. "We gather today to welcome six kits into their lives as apprentices." continued Bluestar once the clan had gathered. "Weedkit, you will be known as Weedpaw. Crookedfeather, you will be mentor to Weedpaw. Mistykit, you will be known as Mistypaw. Coalwater, you will be mentor to Mistypaw. Shadowkit, you will be known as Shadowpaw. Gorsefur, you will be mentor to Shadowpaw. Deerkit, you will be known as Deerpaw. Fawnfur, you will be mentor to Deerpaw. Midnightkit, you will be known as Midnightpaw. Mooncry, you will be mentor to Midnightpaw. Clawkit, you will be known as Clawpaw. Mousefeather, you will be mentor to Clawpaw." Weedpaw glanced around the clearing and padded over to Crookedfeather. "Let's go check out the territory." meowed Crookedfeather as she touched noses with Weedpaw. Mistypaw purred happily and padded over to Coalwater. "Ready to learn how to hunt?" meowed Coalwater as he touched noses with Mistypaw. Shadowpaw puffed out his chest and padded over to Gorsefur. "Let's go work on some fighting moves." meowed Gorsefur as he touched his nose to Shadowpaw. Deerpaw puffed out his chest and padded over to Fawnfur. "Mind if we come with you?" Fawnfur meowed to Crookedfeather. Purring happily, Midnightpaw padded over to Mooncry. "I hope it's okay if we join you." Mooncry meowed to Coalwater. Clawpaw flicked her tail and padded over to Mousefeather. "Go get to know your new denmates." meowed Mousefeather as he touched noses with Clawpaw. "Weedpaw, Mistypaw, Shadowpaw, Deerpaw, Midnightpaw, Clawpaw!" cheered Cindershadow for the clan's newest apprentices.